Can you confirm these amateur observations of Cordylus minor? Type locality: just north of Matjesfontein [Western Cape Province], South Africa. FitzSimons, V.F. 1943. The lizards of South Africa. Transvaal Museum Memoir No.1 (Pretoria), 528 pp. Mouton, P. le Fras N. & Wyk, Johannes H. van 1989. 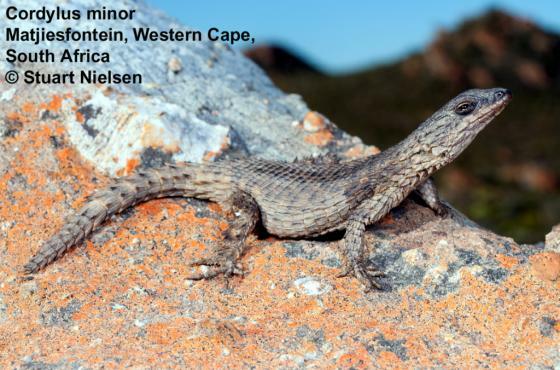 Cordylus minor: A valid species of South African lizard (Reptilia: Cordylidae). South African J Zoology 24 (4): 322-328. MOUTON, P. LE FRAS N.; DAHNÉ A. JANSE VAN RENSBURG and JOHANNES H. VAN WYK 2010. Epidermal glands in cordylid lizards, with special reference to generation glands. Zoological Journal of the Linnean Society 158: 312–324.